Inventory is tightening up just about everywhere and prices have creeped up. Homeowners are in many instances holding on to properties whereas before they may have considered selling. Is this a sign that the housing bottom is behind us? Perhaps…. 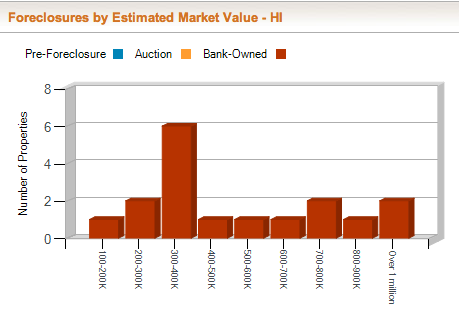 ….but others still clamor that the banks are holding back about 90% of their foreclosed inventory and we’re about to get whacked back down again, maybe sooner than we thought. Do you agree? 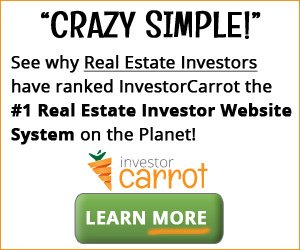 I can tell you from my own experience running my real estate investment company that many homeowners today are also choosing to turn properties into rentals to either cash flow or at least break even and wait out an expected price appreciation to sell down later on the road for more gain. The controversial Oahu rail project continues on, despite calls for its removal both in and out of the mayoral race. It’s my opinion that the temporary tightening of inventory in Hawaii is just that — temporary. Sure, the banks can’t open up the faucet on wide of their shadow inventory and flood the market — we all know that will depress the local housing market to levels possibly even lower than they were a few years ago. But they have to figure something out and that REO pipeline will stay open for, as some estimators predictor, 3 to 5 years. But here’s thing — it’s still very much tied to JOBS. And while Hawaii’s unemployment rate is very favorable compared to those of our mainland cousins (thanks to encouraging recent tourist numbers), we’re still connected to the national system and all its wonderful nuances. 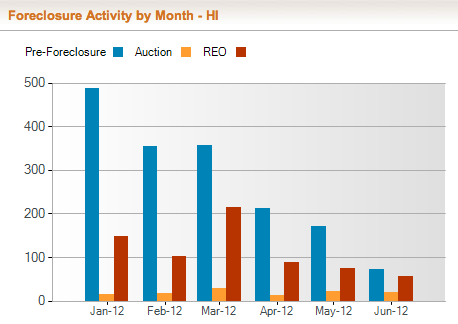 As this bar chart surely shows, the key point of interest is the steady decline in properties in Preforeclosure. In case you’re not familiar with the term, “Preforeclosure” generally means homeowners who are in default but have yet to be officially foreclosed upon. In other words, they are still the homeowners on title. To the point, I have a hard time believing that the numbers of homeowners in default went from just under 500 in January to under 100 in June — as is many times the case, stats can be deceiving and not tell the whole story. I suppose there could be a logical reason for this, some mix of increased refinancing and/or successful loan modifications (the latter unlikely). Anyone care to shed some light? In this chart we can see, unsurprisingly, that the vast majority of homes either headed for foreclosure or already past that point fall in the 300-400K category. Unfortunately, these numbers include all housing types (SFH, townhouse, condo) so making a clear inference is a bit difficult, but it would appear that most homeowners in Hawaii needing help are in the lower end of the price spectrum when compared across the state. However, interestingly enough, the high end luxury homes are represented as well — I guess some people bit off more than they could chew in the good times! By the way — completely unrelated — but is anyone else enjoying this year’s flowers as much as me and my girlfriend? ?